WPIX - "Anyone with information in regard to this man’s identity can call Crime Stoppers at 1-800-577-TIPS (8477)." 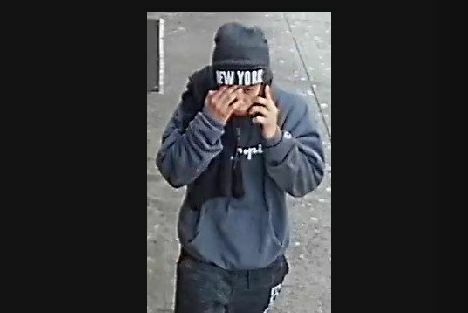 QUEENS, N.Y. -- (WPIX) -- The NYPD is looking for another man in connection to the deadly shooting on the 7 train platform in Queens earlier this month. Police released the above photos on Monday night of a man wanted for questioning in regards to what they believe was a gang-related shooting and killing on a Manhattan-bound 7 train platform in Queens on Feb. 3. The man wanted for questioning is likely between 20 and 25 years old and was last seen wearing a dark “New York” skull hat, dark clothing, and white sneakers, authorities said. Last week believed MS-13 member Ramiro Gutierrez was arrested for the shooting and charged with murder, gang assault and criminal possession of a weapon. The same week Gutierrez was arrested, the NYPD released the below photos of two men also wanted for questioning for the shooting.